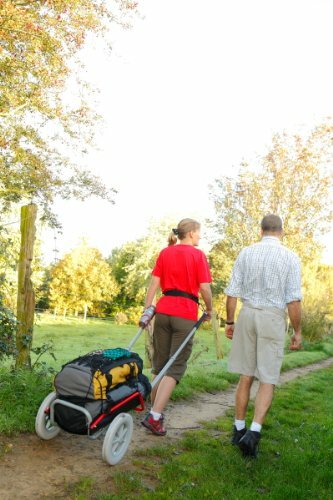 Allows you to carry up to 30kg effortlessly.The goal is to have a load of 2kg at waist level (no more, no less). Carrier weight: 6.1kgs;This adjustment is made by balancing the load on the axle or by adjusting the frame on the axle (3 possible settings, all to have a perfect balance);The 2 support arms are also adjustable in width to fit any size. 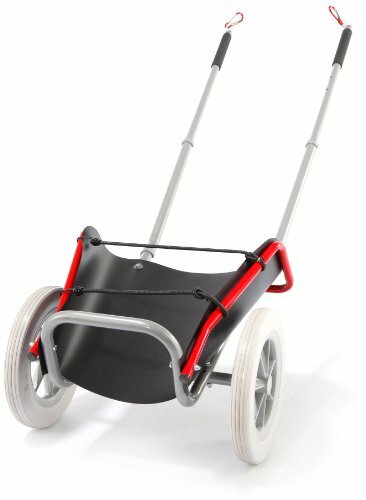 3 widths are available.The two support arms are clipped by a carabiner on a belt with two possible settings;Tube diameter 25 and 30mm in aluminium (except the axle is made of steel)315mm diameter wheel semi soft rubber for comfort, strength and silence.The carriage is disassembled into parts in 1 minute and completely in 5 minutes.